Then I Got To Thinking...: A letter to Andie... you're two months old! 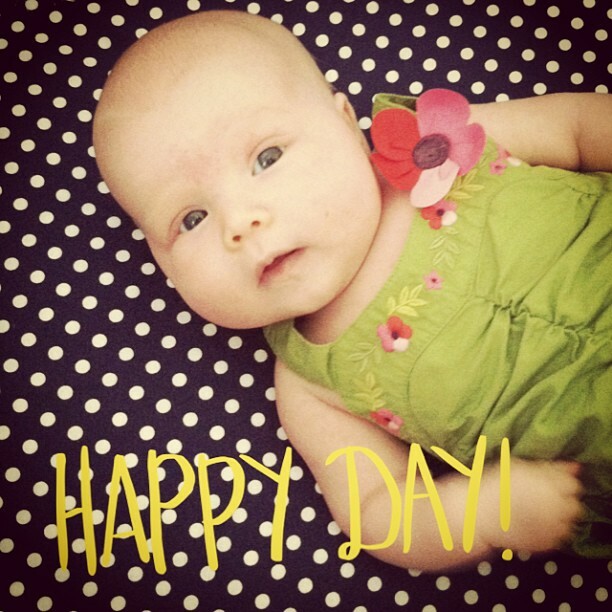 A letter to Andie... you're two months old! Oh my goodness, my beautiful daughter. My love for you has intensified and getting to know you each and every day has been so much fun. You're becoming so much more alert and taking in the world. Seeing you look around at your surroundings and learn is amazing. I am cherishing the moments with you. You've changed so much since the day we took you home from the hospital. 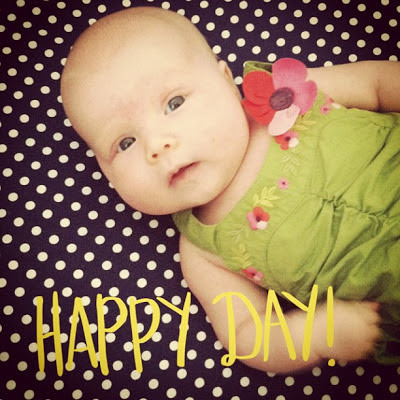 Your beautiful eyes are open so much longer during the day, you are learning to "talk", smile, and respond to us. I stare at you often because it's still hard for me to believe that you are a part of me, that those arms and legs developed and grew inside my body. I feel a special connection to you, and it warms my soul to think that you are my daughter. I am still getting used to the idea that I have a daughter and I am a mom. It's absolutely the most surreal thing. You took your first day trip to Tahoe with us for Fathers Day and did very well riding in the car. You love looking at ceiling fans, and when you lay on your activity mat and watch the lights and movement, you move your arms and legs while you watch. You are very strong, holding up your own head for long stretches of time. You LOVE your bath time. If you are a little fussy, you are quickly very content when you're in the water. I love giving you baths. You also pooped (big time) in the tub this month, we had to get an entire new sponge! You slowly have made your way into the 0-3 month clothes, although many of your little newborn clothes still fit you. You started wearing size one diapers at about 5 weeks old. We estimate (and will know for sure at your doctor's app next week) that you weigh around 10 or 11 pounds. You've given me some wonderful nights of sleep, going 6 to 7 hours about 3 times - but most often you still are up about twice a night. But I don't mind. I enjoy the quiet time with you in the middle of the night. You are so precious. Your smiles make my heart jump. When I see them, life is put into perspective. You have started to give us more and more of them. At about 6 weeks old, your daddy came home from work and you gave him huge smiles... he nearly melted on the floor. You definitely have him wrapped around your finger. I hope you never underestimate the depth of our love for you, sweet girl. I am still learning so many new things. You've been a trooper with me going back to work, coming along with me to meetings and events. People are always commenting on your chubby cheeks and little feet and when you're awake, your eyes. It's a lot of fun to share with others the joy we feel because of you. Your entire family adores you! I am so thankful for you, Andie. I love you. The picture with Andi in the ergo! She looks so happy and content! Love! Such a cutie!! 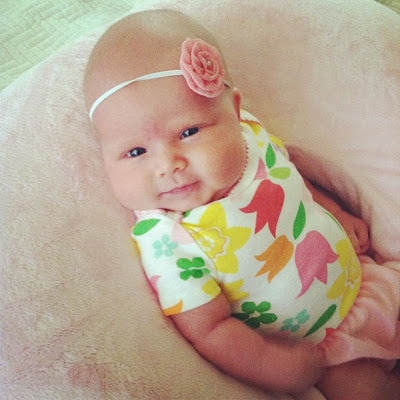 :) Her cheeks kill me! This is too sweet! She's already getting so big! She is such a cutie! My sister just had her first in March, it's been so fun watching him grow and develop! I wish I were closer to home to spend more time with them. It's amazing to watch them learn new things. Great pictures! This is such a beautiful letter for a beautiful baby girl. I can't wait to meet her one day! 2 months already!!! Wow! Time is flying! She is SO cute and I love her chubby cheeks. You already had to go back to work? You are amazing to be sleep deprived and working already!!! Oh isn't she just darling! I just love all her outfits. That picture in the Ergo is too cute! Happy 2 months Andie! This is sooo sweet. You have such a pretty girl. can't wait to kiss those chubby cheeks! So cute! I can't believe she is 2 months already! I hear ya about the driving.. that is the worst. p.s. that picture of her with daddy in the carrier is too sweet! She is just so beautiful!!! But how is she already 2 months?! I mean can you believe it? !